For this winter installment of DJ of the Week, we are featuring Mark and Steve from Sounds Inflicted! These are two of our most experienced DJs, having been at The Core for over 12 years! Read below to learn how they keep their show fresh and fun. How long have you been at 90.3 The Core? S: 12 years. I joined in summer 2005 along with Mark. M: I took a short hiatus in 2009 or 2010, but still guest-hosted with Steve during that time period. What made you want to join The Core? M: I had been a DJ briefly when I was in college, and then Steve and I did some radio comedy stuff at WRSU in 2003/2004. 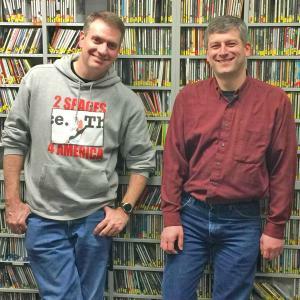 After this, we wanted our own show, which was hard to come by at WRSU, but I had heard 90.3 The Core might be seeking DJs to fill in during the summer break. We got trained in Spring 2005, then applied for our first show in the summer of 2005. Where did the inspiration for your show name "Sounds Inflicted" come from? S: When Mark suggested doing a show, I joked that it would give us a chance to inflict our musical tastes on the listeners. Mark came up with the Sounds Inflicted show title. I can only take credit for introducing the word “inflict” into the conversation. What has made you want to keep doing your show for so long? M: The reason that I keep wanting to be a DJ is the opportunity to hear so much fantastic new music. My top 5 bands hadn't changed in like 20 years until Steve and I got the radio show at The Core. Now 7-8 of my top 10 favorite artists are artists I only discovered while being a DJ. Seriously, I might have never even heard Röyksopp, and they're now firmly cemented in my top 5, maybe even top 3. I shudder to think that I might not even know that they exist were I not a DJ at The Core. I'm now kind of addicted to checking out as much of the new music as I can, which is why I like the playlist requirement and haven't sought a specialty show. S: Being a Core DJ continues to be fun. In addition to discovering great new music, we can play our favorite obscure (or not so obscure) tracks from our own collection and engage in what we like to think of as “witty banter” during our on-air discussions. Even if the listeners aren’t entertained, we generally amuse ourselves at least. Have you ever disagreed on what music to play or the direction of your show? M: Absolutely, but always in a fun, friendly way. Steve's a perfect co-host for me because our primary music tastes overlap very substantially, but our slight areas of difference generally don't anger the other one (just mildly annoy, heh, heh). S: I can’t recall any significant disagreements, which is probably why we’ve successfully done a show together for so long. If one of us plays a song the other didn’t care for, we may just jokingly brand the song an “inflicted sound”. What has influenced your tastes in music? M: My dad's 8-track tapes (Simon & Garfunkel, The Irish Rovers, The Kingston Trio, and Earth, Wind, & Fire), the late 70's AM radio that my mom had on whenever she had my brother and I in the car, one of my childhood friend's collection of Beatles albums, American Top 40 with Casey Kasem in the early 80's, MTV and my high school buddies in the mid-80's, my college pals in the late 80's. S: My parents introduced me to 60’s & 50’s rock, such as The Beatles, The Beach Boys, Buddy Holly and The Ventures. Popular music of the early 80’s was a big influence since that is when I first got into then-current music, such as Men at Work, The Police and Billy Idol. Watching TV & movies exposed me to great themes and soundtracks, such as Mission: Impossible, Hawaii 5-O and Star Wars. Being a DJ at The Core has exposed me to more recent acts (relatively speaking), such as Röyksopp, Freezepop, and St. Lucia. What has been your coolest experience as a Core DJ? M: Personally for me, I'm very happy to have enlisted The Core's aid for the annual Tour De Franklin bicycling fundraiser for the Franklin Food Bank, which is held the last Sunday in April. The Core has been amazingly helpful at the event, and I think it's been a great way for the students to market The Core to new potential listeners and to demonstrate their community awareness and generous spirits. S: A specific experience doesn’t leap to mind. But I appreciate that The Core provides its DJs remarkable freedom to play the genres and tracks that interest them, FCC rules permitting. Any advice to new/prospective DJs? S: This echoes Mark’s earlier comment… Listen to the new music at the station with an open mind. You may discover your new favorite band. When I first joined The Core, my initial inclination was just to play music I already knew. But I soon learned to appreciate that great new music is out there.